After 21 disastrous polls, when will Turnbull be replaced and by whom? After 21 disastrous polls in a row, it is only a matter of time till Malcolm Turnbull is replaced as leader. The question is, who will replace him? Asks John Passant. HAPPY 21st, Malcolm. I am, of course, referring to the 21st Newspoll in a row that has Labor in front of the Coalition on a two-party preferred basis — this one by 54% to 46%. The Turnbull Government’s primary vote support has fallen around 6% since the election last year, while Labor’s is up a bit over 2% on first preferences. The Greens remain more or less steady at 10%, while the vote for the catch-all "others" has fallen almost 4%. One Nation has risen from 1.3% nationally, to 9%. Years of Labor in power in the previous three decades have seen some workers look for alternatives to their traditional party. It has been a similar, although smaller, declining trend for the Liberals. It looks as if the swing against the Liberals and Nationals is made up in the main by a swing to One Nation, with some voters switching directly from the Coalition to Labor. It may be that those who moved away from the Coalition to One Nation will return to the Coalition after registering a protest vote with Pauline Hanson’s party. Some will go to Labor, although the 50/50 split based on the last election looks to me to paint too rosy a picture for Labor. 60/40 might be a better split. Given we are still as much as two years out from the next election, making predictions on what might happen at an election then is always fraught with immense danger. However, I am feeling crazy brave and will call it. Malcolm Turnbull and his Government are dead men and women walking. Bill Shorten and the Labor Party will win the next election. Such a swing would see this Government fall. Malcolm Turnbull could no longer lead the Liberal Party. Minister for Immigration and Border Protection Peter Dutton – rated the worst health minister in 35 years by doctors back in 2015 and leader of the reactionary faction of the Liberal Party – had a margin of 1.6% at the last election. The recent distribution increases that margin a little, to 2%. He will still lose his seat. Here’s your hat, Peter the Barbarian, what’s your hurry? In fact, knowing that he is a sneaky, underhanded and brutal immigration minister, my guess is that he and the other reactionaries in the party might be tempted to challenge Turnbull in the next six months, assuming the Turnbull Government lasts till then and that the polls continue to show the Coalition well behind Labor. Why? First, Dutton might erroneously believe that he can retain his seat if he is prime minister. Second, he might think that his barbaric approach to refugees can be transferred under his leadership to politics more generally and that barbarism will help the Coalition stay in government. Third, 30 bad polls in a row is a convenient excuse given that it is the one Turnbull used to justify his challenge to Abbott. That 30th bad poll will, I think – and accounting for the Christmas break – arrive some time in February or March 2018. Does Dutton have the numbers? It is hard to know, but those in marginal and not so marginal but now at risk seats might cast an eye towards their one seemingly "successful" minister as saviour. 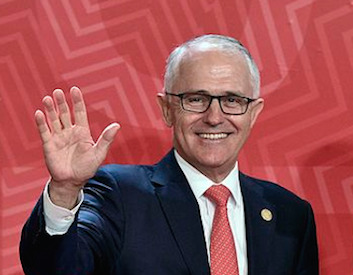 Of course, the last "success" story as brutal immigration minister, Scott Morrison, has gone on to distinguish himself so much as Treasurer that he has effectively ruled himself out of contention for any future role in the Liberal Party’s leadership. The same fate is likely to befall Dutton. It is easy politically to attack refugees and asylum seekers. It resonates with a significant number of Australians but alienates and angers about 25% of us. But othering Australians is another matter, assuming those Australians are not Aborigines, Asians or Muslims. Othering refugees distracts our attention from the neoliberal project but othering workers is a completely different task and success at the former does not guarantee success at the latter. Kevin Rudd, Julia Gillard, Tony Abbott, Joe Hockey all come to mind. Attacking asylum seekers might be the card trick that bedazzles some people. However, when winning power and managing capitalism means that the role of government is to attack poor people and workers to shift wealth from labour to capital, the contradiction is – as the failed Abbott/Hockey 2014 Budget shows – that you effectively sign your political death warrant in doing that. Falling real wages, underemployment, unemployment, precarious and casual jobs all contribute to a sense of anxiety among many workers. The uncertainty also makes small business restless. Changing leaders won’t address that reality. Other than Dutton, who is there? Minister for Foreign Affairs Julie Bishop? She does not have the support to roll Turnbull before the election. She might at best be an interim leader after the election loss. Morrison is a spent force. Minister for Defence Industry Christopher Pyne might lose his seat — and, in any event, is too liberal for the reactionaries. Already, there is talk of the second tier of leadership stepping up — people like Minister for the Environment Josh "the Coal Kid" Frydenberg. Seriously, is he the best of the new guard that the Liberals have to offer? What about a return to Tony Abbott? Ha ha ha! Or in his own words: "almost impossible". The crisis of political leadership is a global crisis. It is a crisis of neoliberal capitalism. Bill Shorten and Labor will win the next election by default. That they are not the Liberals is their main strength. It is hardly inspiring for those of us wanting fundamental change in favour of the working class and the poor, not the rich. "Far too many New Zealanders have come to view today’s capitalism not as their friend but as their foe. And they are not all wrong." Following on from that comment, Prime Minister-elect Jacinda Ardern was asked if capitalism had failed low-income New Zealanders. "If you have hundreds of thousands of children living in homes without enough to survive, that's a blatant failure. What else could you describe it as?" The task for the left in Australia has to be to make the point day in and day out – with three million Australians living in poverty and wages falling – capitalism is a failure. We need fundamental change, not tinkering at the neoliberal edges. Turnbull challenged former PM Tony Abbott after 29 unfavourable polls in 2015. Read more by him on his website En Passant or follow him on Twitter @JohnPassant. Signed copies of John's first book of poetry, Songs for the Band Unformed (Ginninderra Press 2016) are available for purchase from the IA store HERE. Abbott v Turnbull: Undermining as art form https://t.co/YQ5TPo32oN. "Ruthlessly successful as opposition leader, hopelessly inept as PM ..."
Challenge the system. Subscribe to IA for just $5.